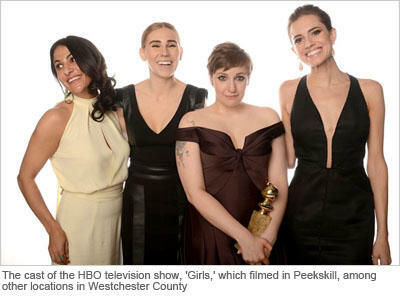 Aug. 15, 2014 -- While television viewers around the world gear up for the 66th Annual Emmy Awards Show on August 25, 2014, Westchester County, New York is beaming over the 29 Emmy nominations received by various series that have filmed here recently. "From dramas to comedies, period pieces to courtroom thrillers, TV series filmed in Westchester cover it all," said County Executive Robert P. Astorino. "We congratulate the brilliant actors, directors, casting agents, editors, makeup artists, and all of the creative talent that have earned Emmy nominations this year. We&apos;ll be cheering for you on Aug. 25th." Westchester County offers an array of attractive backdrops: parks, shorelines, historic Main Streets, suburban neighborhoods, an airport, colleges, historic mansions, and bustling urban areas. Several sound stages and post-production facilities have ample space in which to build sets, record, and edit. For example, Haven Studios in Mt. Vernon was recently transformed into the interior of a suburban residence and police station for the HBO/Warner Bros. Television show, "The Leftovers." "It&apos;s a terrific lineup," says Natasha Caputo, Director of Tourism and Film. "We&apos;re proud of the recognition that these shows have received, and are pleased to be working in concert with so many in the film industry, who recognize the tremendous assets and film-friendly climate available in Westchester County, and whose work benefits our local economy," said Caputo.